Congratulations to Brandon Shuck and Andrew Gase who were among the winners of the 2018 GeoPRISMS AGU Student Prize! 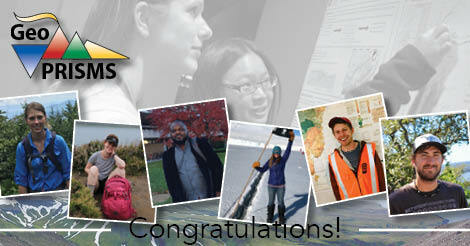 The GeoPRISMS AGU Student Prize is awarded to students for outstanding research presented as either a talk or poster presentation at the annual AGU Fall meeting. Each year two students receive a $500 cash prize and four students are selected for honorable mention. The competition is open to both US and international students. UT students have featured among the winners every year since 2015. The two overall winners were Kirstie Haynie (University at Buffalo) and Rachel Marzen (Columbia University in the City of New York) for best oral & poster AGU presentations. Honorable Mentions were awarded to Andrew Gase and Brandon Shuck (University of Texas Institute for Geophysics), Tiegan Hobbs (Georgia Institute of Technology) and Emmanuel Njinju (Virginia Tech). GeoPRISMS is a community funded by the NSF which studies the origin and evolution of continental margins and supports multidisciplinary research that combine marine and terrestrial approaches. GeoPRISMS has a long history of supporting young scientists who benefit from early career scientist workshops, training exercises and awards designed to recognize achievement among young scientists. This is Brandon’s second GeoPRISMS AGU Student Prize, having received an honorable mention in 2017 for a poster presentation he gave about his research on the Eastern North American Margin, a continental rifted margin along the eastern seaboard that formed when the supercontinent Pangea broke up 200 million years ago. 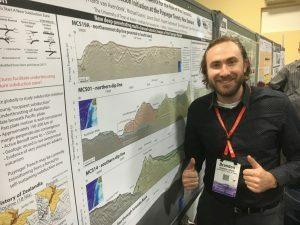 This year, Brandon received another honorable mention, this time for a poster presentation at AGU about seismic reflection data gathered in February and March 2018 at the Puysegur Trench, a juvenile deep-sea trench off the coast of New Zealand’s South Island, where the Australian Plate is pushed beneath the Pacific Plate. The Puysegur Trench is interesting because it is only about 10 million years old, which is relatively young compared to other tectonic plate boundaries around the world. Brandon and other scientists are using geophysical data in this location to better understand how the Australian plate started to slide under the Pacific plate, which could help unravel the long-lived mystery of how a new subduction zone forms. Brandon’s was one of four posters about the Puysegur Trench: each one looked at different data gathered from the same area. Andrew presented a talk at AGU Fall 2018 on a different part of New Zealand, the northern Hikurangi margin. The Hikurangi margin lies along the east of New Zealand’s North Island and is a fast moving subduction zone where a large volcanic plateau of the Pacific Ocean zone is descending beneath New Zealand. Over the last 150 years, plate motion along the Hikurangi margin has been marked by a few powerful earthquakes, episodes of slowly creeping slip between the tectonic plates, and local tsunamis. The SHIRE Project is a collaboration between scientists from the United States, New Zealand and Japan, trying to understand how seismicity is affected by the structure of the subduction zone. As one plate is pushed under another, the area where they meet, known as the plate boundary, can become heterogeneous: in other words, it becomes characterized by scattered geological features such as seamounts which are pushed underground by the down-going plate, or volcanic sediment stuck to the bottom of the upper plate. The SHIRE Project seeks to learn whether these provide frictional conditions that promote both fast earthquake ruptures and slow, barely perceptible tremors known as slow creep events. trying to understand how plate motions are caused by underthrusting of seamounts and sediments at the Hikurangi margin. 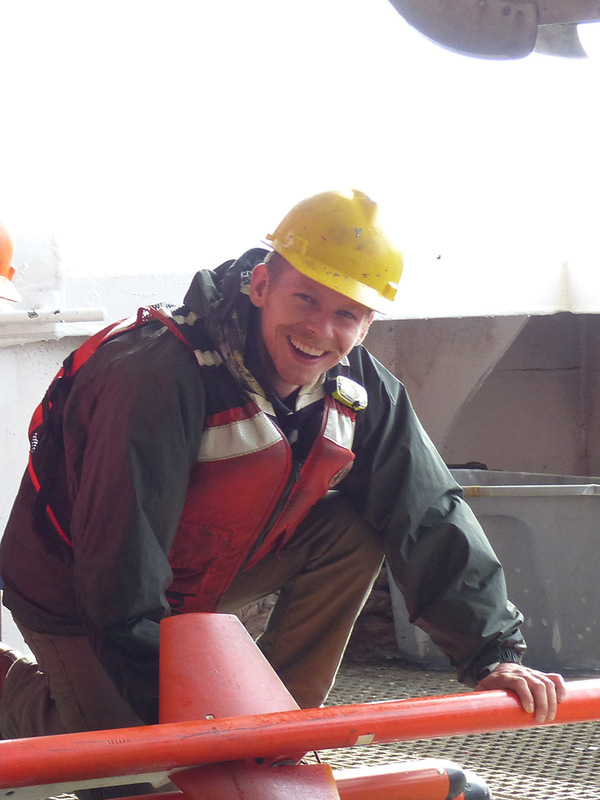 Andrew has helped collect seismic data at sea and on land in New Zealand and has used these data to create images of the Earth beneath the subduction zone. Andrew’s talk explained why studying the Hikurangi margin is important and showed some of the interesting new observations made by the SHIRE project, a UTIG-led international collaboration working to better understand earthquakes occurring at subduction zones. Both Andrew and Brandon are supervised by Harm Van Avendonk, senior research scientist at the University of Texas Institute for Geophysics.